Baby led weaning or BLW has been a revolutionary change in how many of us choose to wean our babies on to solid foods (thanks Gill Rapley). It involves giving your baby chunks of food right from the start of weaning, allowing your baby to feed themselves and many have embraced it as it means no more cooking up batches of baby food as you do with traditional weaning! We know that introducing solids to babies this way tends to result in them having higher salt intakes than those who are weaned traditionally on pureed food. This is because many of the foods that lend themselves to baby led weaning are naturally salty - think bread, cheese, crackers, breadsticks. It's not easy for your little one to obtain a balanced diet when your baby led weaning either because often the quantities of food actually swallowed are so small. I love BLW for its sensory experience and it's family mealtime social interactions but unfortunately, nutritional deficiencies do happen. Therefore in this series of blogs, I’m going to guide you through how to maximise the nutrition your baby gets even if she only manages to eat a tiny bite and the rest goes on the floor, up the walls or in her hair! I wanted to start this series of posts with blw breakfast as it’s often a chaotic time of day, so much needs to happen first thing and if your little one is anything like mine, you didn't get a good nights sleep, to begin with and so are often starting out in a hurry and a bit bleary-eyed! I hope a few breakfast ideas for babies (and the rest of the family actually) might be helpful. By six months old your little one is capable of sleeping through the night (in an ideal world) and so won't have had any nutrition for around 12 hours or so and will need refuelling. At the start of weaning your probably going to begin the day with a milk feed and food will come later, but from 7 months or so and onwards you want to encourage food first and milk later on in the day. This is so that your baby gets a better range of nutrients more in line with what her growing body needs. Eating breakfast has been linked to good health outcomes too, did you know when children eat well at breakfast time they grow into kids who do better at school with improved concentration and improved memory. They are also less likely to become overweight or obese too. When we think about breakfast for ourselves many of us will choose sweet foods such as cereals, juices, toast with jam, fruit, pastries, smoothies, pancakes, waffles and yoghurts. Some of these contain natural sugars like whole pieces of fruit and natural yoghurt but the majority of sweetness comes from free sugars, and this is the type that is bad for us if eaten in excess. Don't get me wrong, I don't mind your baby having a little bit of sugar in foods that need it, bread wouldn't rise without sugar and the occasional biscuit or cake is perfectly fine. We certainly don't want our babies to have a lot of free sugars, although it doesn't do any harm directly unless teeth brushing is an issue, it encourages a preference for sweet foods or a ‘sweet tooth’ which can lead to them eating too much quite easily when they become toddlers and young children. At the start of weaning babies use their whole hand to grab pieces of food, therefore what you provide needs not to be too wide so that they can close their fingers around the food to make a fist. I suggest stick shaped foods that are around 5cm long are ideal, so that when her fist closes around it some pokes out the end. Don't bother with a plate, it will just get chucked on the floor, the high chair tray or table top is perfect, just make sure it's scrupulously clean. Your baby will also rake her hands across the tray or table to pick up foods. I can be overwhelming if there are a lot of foods to choose from so I suggest placing just one or two items in front of her at a time. Softer finger foods that will squash easily in her mouth are good to start with too, as a rule of thumb, if you can squash the food in between your thumb and forefinger easily it's generally going to be soft enough for her to manage. For example, try squashing a banana in this way, it's perfect. You don't need to offer single individual foods at the start of weaning either, this harks back to the days when weaning started at 4 months and you had the luxury of 8 weeks to offer different foods to your baby. Now that we start later, we have less time to get those critical nutrients into our weaning baby. It should go without saying but for safety’s sake make sure your baby is developmentally ready for solid foods before your start baby led weaning. If your not sure what the three signs of developmental readiness are, you can download my free guide. If she's not ready and she's 6 months old, consider traditional weaning with purees via a spoon. Note: I've linked to weaning recipes when I've found a good one! 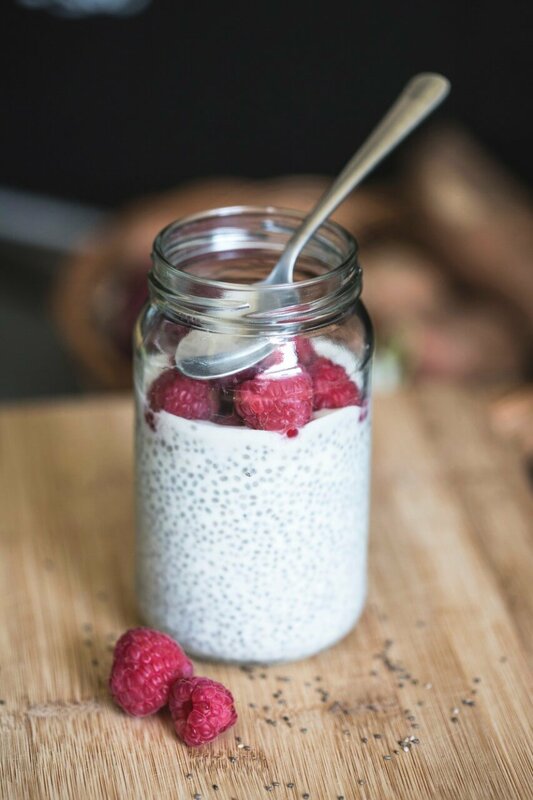 Chia pudding with blitzed berries - yes it is OK to give your baby a spoon and see what happens! This list is not exhaustive, there are plenty of others and do offer more than one food item at each meal once first tastes are accepted. 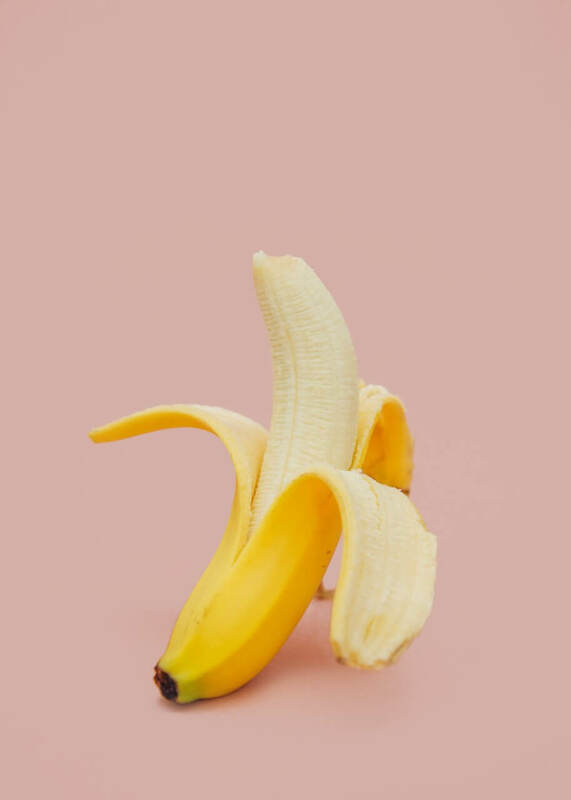 Sometimes first foods are slippery to hold in little fists, you can try keeping the skin on half a banana, a slice of mango, avocado or kiwi to give it a bit more grip. Just make sure it’s been washed first as it will inevitably end up in her mouth. Rolling slippery foods in ground almonds, ready brek, instant oats, desiccated coconut or breadcrumbs really help too and adds a little more nutrition. Now that your baby has mastered eating and is on three meals a day, it’s time to start consciously planning their meals so that they are nutritionally balanced. 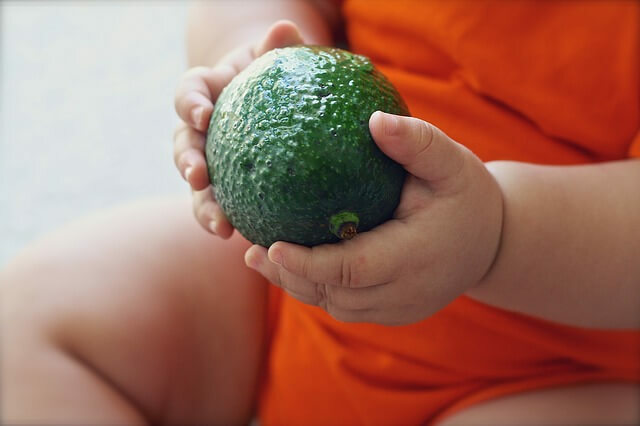 A critical nutrient that your baby needs at this stage is iron. Your baby is born with a store of iron that is laid down in the third trimester of pregnancy and this has run out by the time she reaches 6 months of age. Neither breastmilk nor formula is an adequate source of iron and so it must come from the food she eats. The phrase ‘food is fun until they’re one’ is just not true! Iron is used to make red blood cells which transport oxygen to your baby’s brain and we know that those who don't get enough iron can be affected cognitively in terms of being able to concentrate and even influences their future intellect. Low iron can also affect how your baby grows and her immune system too. Omega 3 is also considered a critical nutrient and the best source of this comes from oily fish like salmon, mackerel or trout. Vegetarian sources of omega 3 are chia seeds, linseeds, hemp, walnuts, pecans, hazelnuts, tofu, rapeseed oil and in some green leafy vegetables. At this stage, your baby will have mastered the pincer grip which is where she uses her thumb and forefinger to pick up foods. Her dexterity will be better too meaning you can offer smaller pieces of food. This is great in terms of mastering hand-eye coordination. She may be crawling or cruising and wants to be on the move meaning she’ll be frustrated when restrained in her highchair. If this happens, let her out but never let her eat outside of the highchair. She doesn't yet have the skills to do this which means that eating on the move puts her at greater risk of choking. Once out the chair, if she indicates that she wants food, pop her back in explaining that eating happens in the highchair, She’ll soon cotton on. If your baby has teeth you can start to offer crunchy ‘al dente’ foods like steamed veggies, if she can’t yet manage these textures she’ll gag and spit them out. Gagging is completely normal and your baby has to do do this in order to learn how to move food around her mouth. If she doesn't yet have teeth avoid crunchier foods as they’re still a choking hazard. Small breakfast cereals served with whole milk and fruit e.g. You may have noticed that I've included smoked salmon in this list and this is a food that is quite salty. It's important for your baby to experience a variety of tastes and textures during weaning which means that she will have to eat salty foods occasionally. This is ok. We just want to avoid salty foods in excessive amounts. You can read more here about salt & weaning and when it's actually OK to have it. Baby led weaning is going to be messy. You are allowing your baby total control of the food that's placed in front of her. This means she will squash it, squeeze it, use it to paint their highchair tray, your walls and feed the dog. Sometimes she might feed herself. I recommend a jet wash (joking) but do invest in a good coverall bib like the Little Chomps Messy Mealtime Smock or Tidy Tot Bib & Tray Kit. A divided plate can be helpful too once your little one is on meals rather than just tastes. I like the Fox Cub Suction Plate, by Bamboo Bamboo which is much more difficult to chuck on the floor! *Note that the links to these products are my affiliate links which means that I get a small commission from the seller should you buy through my link, but the cost to you remains the same. Many of the BLW blogs I read involve making baby led weaning breakfast muffins which are essentially egg baked in a mini muffin tin with a variety of fillings. While these are nutritious, so cute and very easy to cook at home, they are just one food irrespective of the fillings used. What this means is that your baby is not being exposed to the different foods in their whole form because they’re bound up inside a muffin. A big part of weaning is about exploring the sensory experiences that come with food, what it looks like, what it smells like, what it feels like when I touch it and what it tastes like. If food is bound up inside a muffin babies miss out on these important sensory steps and don't learn how to eat that food. The same goes for the very popular BLW pancakes that are on a lot of American BLW blogs! Purees are a texture that babies also need to learn to eat otherwise they would never be able to eat soup, gravy on their Sunday roast and even yoghurts or ice cream. Some baby lead weaning advocates insist that you cant use a spoon or pureed foods. I completely disagree. In fact, I have unfortunately had parents come to my clinic with their toddlers who have feeding problems and often they've missed the critical window during weaning when mastering purees are learned. My advice would be to include them in whichever form you wish, give your baby a spoon and let her spoon feed herself. Just get that jet wash ready! Did you know that all babies gag? They do it as a protective mechanism and it's all part of learning how to eat. This is because their gag reflex is near the front of their mouths. The gag reflex is the same thing that makes you want to be sick when you stick your fingers down your throat, just for babies the trigger is much further forward. Any food can trigger a gag irrespective of the size and shape but allowing your baby to be in control will allow her to place the food as far into her mouth as she knows she can cope with. There is some research that shows that babies learn to manage their gag reflex when self-feeding long stick-shaped foods. These actually encourage the gag reflex to move back, another pro for BLW. I have a free baby weaning guide if you want to learn more about the types of food to offer your baby, when to offer it, how much to serve and how to fit milk feeds in. I hope you found this blog helpful, leave me a comment below to tell me what you think, and look out for next weeks blog where I will be going through baby-led weaning snack ideas.